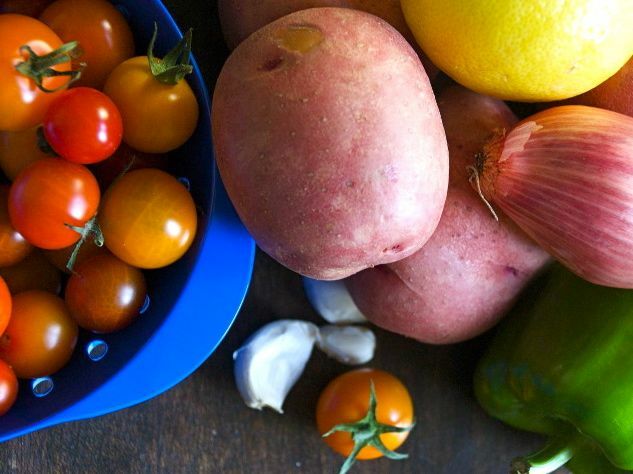 "There is no such thing as a really bad potato salad," Laurie Colwin once wrote. "So long as the potatoes are not undercooked, it all tastes pretty good to me." With the exception of gloopy, overly sweet deli-case renditions, I'm inclined to agree. So many flavors shine when paired with potatoes — that blank slate of a tuber — resulting in endless variations on potato salad. Potatoes, like sponges and hungry teenage boys, absorb whatever you feed them. The essential components of a stellar potato salad include a flavorful dressing, fully cooked potatoes, and something crunchy — celery, onion, peppers, fennel, bacon, etc. 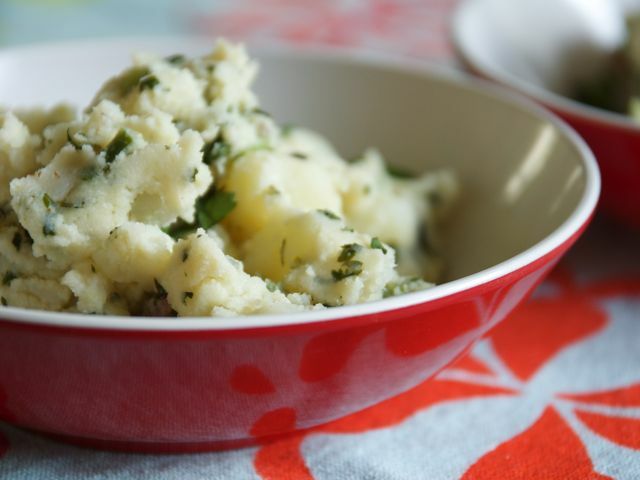 In my book, a good potato salad includes a contrast of textures: soft and yielding potatoes tossed with just the right amount of tangy dressing (not too much, not too little) and paired with the bite of a more piquant ingredient. What kind of potato to use depends on both the recipe and personal preference. I like the way Russets absorb dressing, Yukon Golds break down and get a little mushy, and red potatoes hold their shape. Sweet potatoes pair beautifully with spicy dressings. Purple potatoes, though I fancy the color, always disappoint — too dry and crumbly. Roasted fingerlings make a nice addition to a composed salad. Not only does potato salad lend itself to the imagination and reinvention, it's also easy to throw together. And because most potato salads improve with age, it's a great dish to make ahead for parties, potlucks, and picnics. A scoop of potato salad rounds out the plate, the perfect side to a sandwich, burger, grilled chicken or steak, ribs . . . you get the picture. Toss enough ingredients into your potato salad, and you can call it lunch or dinner. Here are eight variations — ideas from near and far — for transforming the humble potato into a noteworthy salad. #(clear n1). Think vinaigrette. 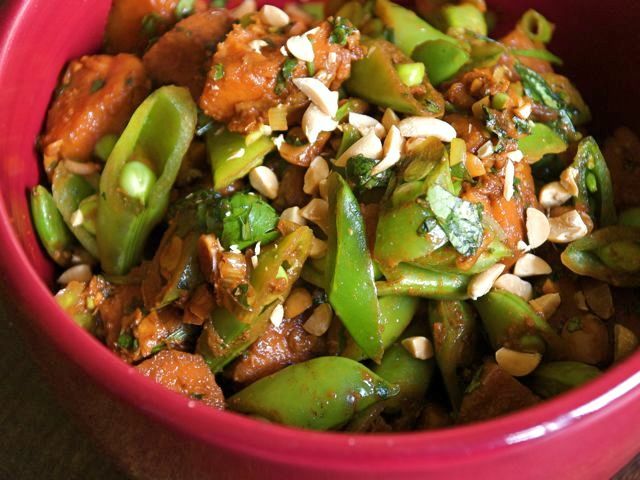 [%image potatogreenbean float='clear right' width=350 caption="Potato and Green Bean Salad"] I adore the tangy, vibrant flavor that comes when potatoes are tossed with vinaigrette; [/recipes/collections/Culinate+Kitchen/Salads/Potato+and+Green+Bean+Salad "Potato and Green Bean Salad"] sits at the top of my list. French potato salads call for preparing the salad while the potatoes are still warm, to maximize how much dressing gets absorbed. [/books/collections/allbooks/potatosalad/germanwarmpotatosalad "German potato salads"], often served warm, combine a sour and sometimes sweet dressing with the smoky crunch of bacon. #(clear n2). Scandinavian. 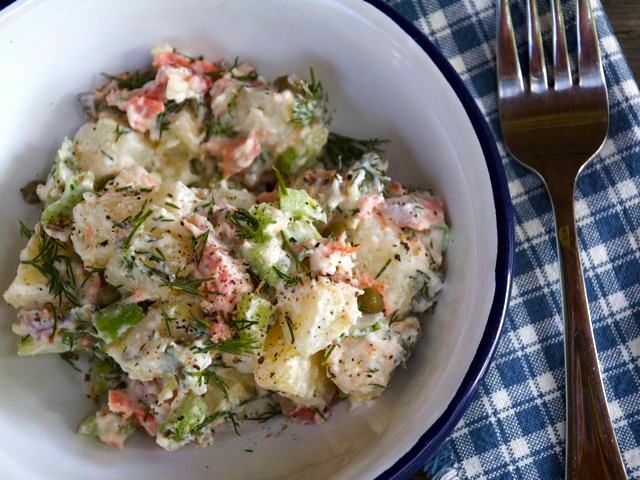 [%image salmonpotato float='clear right' width=350 caption="Potato Salad with Lemon, Dill, and Smoked Salmon"] Decadent and delicious, sour cream or crème fraîche make an easy and pleasing dressing to mix with potatoes. Toss cooked new or red potatoes with sour cream, red onion, and fresh dill; season to taste with salt and pepper; and chill. For a meal-in-a-bowl variation, try [/recipes/collections/Culinate+Kitchen/Salads/potatosaladwithlemondillandsmokedsalmon "Potato Salad with Lemon, Dill, and Smoked Salmon"]. #(clear n3). American classic. 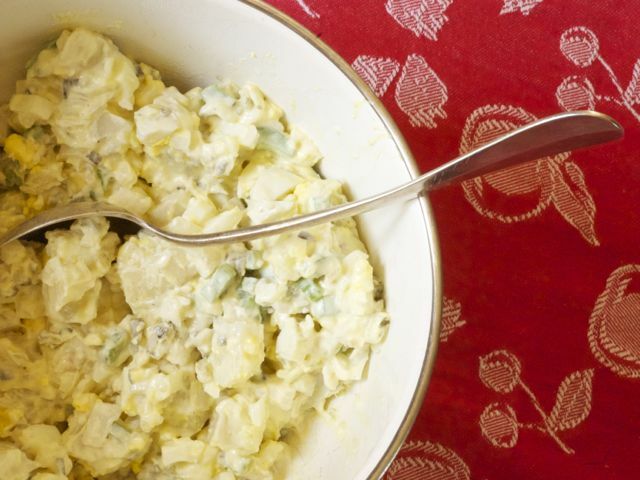 [%image classic float='clear right' width=350 caption="Culinate's deli-style potato salad"] A longtime distaste for hard-boiled eggs and sweet relish keeps the classic American picnic salad off my plate. That said, a well-made bowl of this creamy yellow salad — for me, that means not too much mayo, a shot of vinegar, finely chopped eggs, and sour rather than sweet pickles — is a thing of beauty. Our [/recipes/collections/Culinate+Kitchen/Salads/classicpotatosalad "house version"] is just that. #(clear n4). Seasonal. [%image country float='clear right' width=350 caption="Country Potato Salad"] Potatoes in the kitchen are a cook's blank canvas, easy to pair with whatever ingredients are in season. 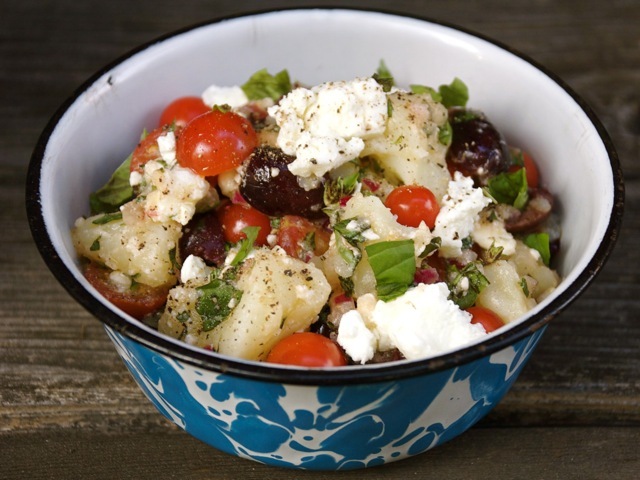 [/recipes/collections/Culinate+Kitchen/Salads/Country+Potato+Salad "Country Potato Salad"] riffs on Greek salad, a vibrant mix of ripe tomatoes and fresh basil. Dilute pesto with olive oil and lemon juice for an easy dressing to toss with potatoes, corn kernels, and cherry tomatoes. 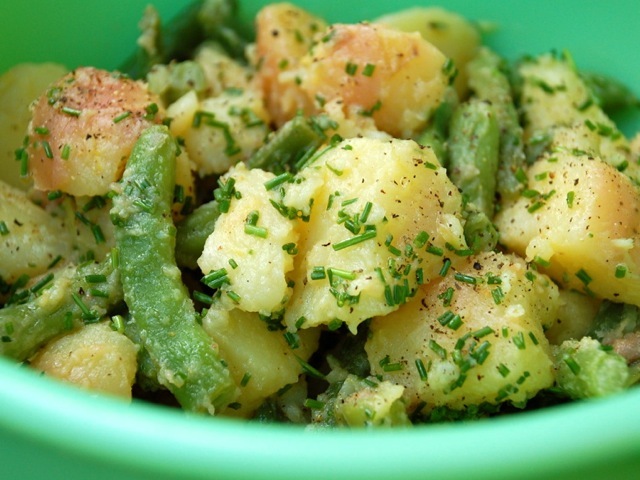 Pair green beans and a lemony vinaigrette with potatoes for a popular summer salad that tastes good in early fall. #(clear n5). Sweet potato. [%image sweet float='clear right' width=350 caption="Sweet Potato Salad with Soy-Ginger Dressing and Peanuts"] I love the taste and texture of roasted or grilled sweet potatoes — caramelized on the outside, soft on the inside. Marry sweet potatoes with [/books/collections/allbooks/potatosalad/grilledsweetpotatosaladwithchipotlevinaigrette "a spicy dressing"] and [/recipes/collections/Culinate+Kitchen/Salads/sweetpotatosaladwithgingerdressing "a crunchy counterpart"] (peanuts, snap or snow peas, chopped onion, etc.) for a delicious variation on potato salad. It's a good-for-you option, too: Sweet potatoes rank high in Vitamin A and C, potassium, and fiber. #(clear n6). Go east. [%image aloo float='clear right' width=350 caption="Aloo Achaar"] Indonesian Gado Gado, a vegetable salad tossed with a warm peanut dressing, often includes boiled potatoes. In Japan, potato salad might be served between two slices of bread or as part of a bento box. [/books/collections/allbooks/worldoftheeastvegetariancooking/alooachaar "Aloo Achaar"], an East Indian snack, fuses sesame seeds and chiles into an addictive combination. #(clear n7). Composed. 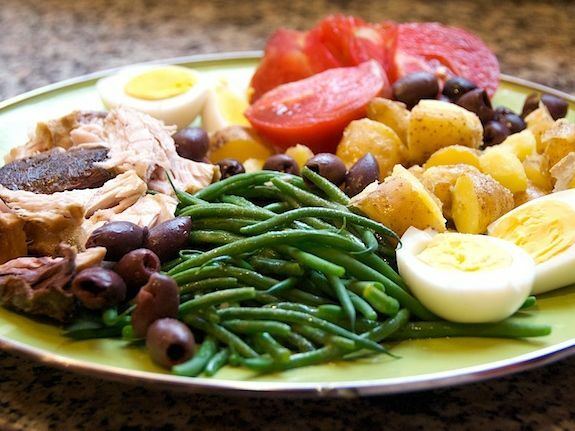 [%image salade float='clear right' width=350 caption="Salade Niçoise"] As part of a larger plate, potatoes add both a filling element and a counterpoint to other flavors and textures, not to mention a good host for absorbing a delicious dressing. Think Gado Gado, [/recipes/collections/Culinate+Kitchen/Salads/salad_nicoise "Salade Niçoise"], and Bachelor Salad — a recent Culinate favorite. #(clear n8). Improvise. [%image potatoes float='clear right' width=350 caption="Everything starts with potatoes."] Mix warm potatoes with House Vinaigrette and you've got the start of a delicious potato salad. Add texture — chopped celery, onion, and/or peppers — and then season with fresh herbs, salt, and pepper. If you've got black olives or capers, toss them in. Feta or goat cheese add a nice creamy, tangy element. Another angle of inspiration: Take a salad you like (think grain, green, or bean) and swap cooked potatoes for the main ingredient. Potatoes instead of [/recipes/collections/Culinate+Kitchen/Salads/Quinoa+Salad+with+Lemon+Dressing quinoa], [/recipes/collections/Culinate+Kitchen/Salads/Romaine+Salad+with+Tomatoes2C+Bacon2C+and+Blue+Cheese+Dressing Romaine] (blue cheese and bacon? Yum! ), or [/recipes/collections/Culinate+Kitchen/Salads/Black+Bean+Salad+with+Chipotle-Cumin+Dressing "black beans"] would all make a fine salad. You can even make a vegan version that combines potatoes with cabbage. p(bio). Carrie Floyd, aka Mrs. Potato Head, is Culinate's recipe editor.